Home Sports Nigeria has re-appointed Samson Siasia as Head Coach of the Senior National Football Team, Super Eagles. Nigeria has re-appointed Samson Siasia as Head Coach of the Senior National Football Team, Super Eagles. followingSunday Oliseh’s resignation on twitter in the early hours of Friday. 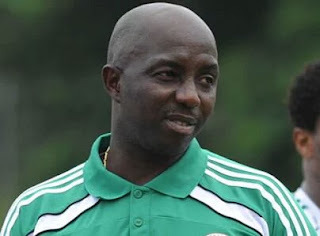 Siasia served as Super Eagles’ Head Coach between December 2010 and October 2011, before his contract was terminated following the team’s failure to qualify for the 2012 Africa Cup of Nations. Amuneke led the Nigeria U-17 boys to a fifth FIFA World Cup title in Chile last year and was hailed for his excellent comportment and maturity, as well as the tremendous skills of his players. Salisu Yusuf and Alloy Agu were in the immediate past crew led by Oliseh and will serve as the bridge with the new team as Nigeria gets set for a potentially –explosive double date with the Pharaohs in March. Nigeria U-17 squad won a fourth FIFA World Cup title in 2013, and then headed the crew that successfully defended the trophy last year. USA in 1994. Amuneke scored against Bulgaria and Italy and Siasia scored against Argentina. Argentina to win Africa’s first Olympics football gold in USA two years later. the NFF, top officials confirmed to thenff.com that he was this week paid the sum of N20 million, being salaries for three months (December 2015, January 2016 and February 2016) and half-year rent for July-December 2015. He was signed on in July 2015. The only money he is owed is the bonus for the World Cup qualifier against Swaziland in Port Harcourt in November 2015, which the NFF had promised to pay players and officials on resumption of camping for the matches against Egypt.